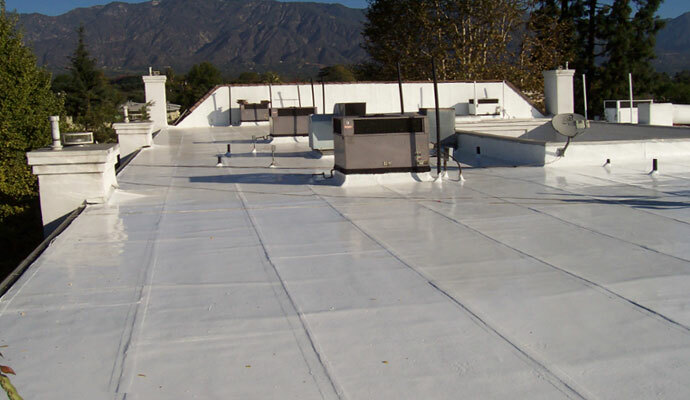 Tuff Kote Systems is the best value for Title 24 compliant roof coating in Orange County and the greater Los Angeles area. Since 1986, our company has specialized in installing residential and commercial coating and waterproofing systems, and we possess the knowledge and expertise required to install the most innovative Title 24 compliant roof coatings available today. Over the years, we have provided our energy-saving, Title 24 compliant roof coatings for countless numbers of commercial and industrial clients, and have a well-established reputation for excellence of craftsmanship, competitive pricing, and exceptional customer service throughout our service area. California's Title 24 Energy Efficiency Standards set forth specific requirements for nonresidential roofing systems. Under Title 24 specifications, certain types of commercial, industrial, and institutional roofing systems built over conditioned spaces are required to meet Title 24 "cool roof" standards. A "cool roof" is a roofing system which meets a particular level of solar reflectance (SR) and thermal emittance (TE) specifications. Solar reflectance is a measure of how much sunlight a roofing system reflects, versus how much is absorbed into the roof's surface. And thermal emittance is a measure of how well the roof gives off or "emits" the thermal energy it absorbs from the sun. Both the solar reflectance and thermal emittance properties of roof coating systems are rated on a scale from 0 to 1, where 1 is the most reflective or emissive, providing the "coolest" roof. This number is key in terms of a roofing system's energy efficiency, due to the fact that the longer that heat is held in the roofing system, the more opportunity it has to travel downward through the various layers of the roof and into the conditioned space in the building. And once there, this heat can greatly complicate air conditioning efforts, resulting in the need for increased air conditioning usage. Rely upon the roof coating experts at Tuff Kote Systems for premium quality Title 24 roof coating installation at competitive prices. We accept Visa, Mastercard, American Express, and checks, and provide estimates throughout our Orange County and greater Los Angeles region service area. Tuff Kote Systems holds California Contractor's License # 982528, and is bonded and insured. Required for many types of roofing systems built over conditioned commercial, industrial, and institutional spaces. Can be installed over almost any new or existing roofing system. Effectively reduces your building's cooling load. Leads to significant savings on energy bills. Increases the comfort of your employees, patrons, and guests. Helps to prolong the life of your building's air conditioning system. Assists in mitigating the "urban heat island" effect in your community. May qualify your business or organization for utility company rebates.